So it’s official. The next few months are when practically everything in my life will change: the roof over my head, the state on my driver’s license, the job that pays the bills, the vocation that’s been my heart. As I shared a few months back, Mike and I are retiring and together with my mom will be relocating to western North Carolina later this summer. Our final Sunday at the beloved church Mike has pastored for 16 years is one month from tomorrow. We close on our home and Mom’s condo, Deo volente, in late July. I’ll work remotely for a few weeks and then retire from my fulltime job in publishing in September. New work awaits. Sentimentality is a blessing as well as a burden. We’ve lived in our home in Wheaton longer than we’ve lived anywhere. I spent the first 24 years of my life as well as the last 16 calling Illinois home. Forty years, with a New England hiatus of 25, in one place. My roots have pushed deep into midwestern soil. The prospect of saying goodbye to friends and our church family, particularly the seniors whose unconditional love encircles our hearts, is painful. It’s said that we process the grief of change before we realize the benefit of change. There is that. The letting go. And there is this. The looking forward. Yesterday I did my daily lap around the large pond in the park near our home. When I reached the bridge over a small inlet, I spotted a pair of ducks, mallard and mate, still as carved wood along the riverbank. They’re there every morning. At my approach, the male pushed off from the shore, emerald pinfeathers gleaming in the early morning sunshine, paddling serenely towards the opposite shore. After a moment’s hesitation, his mate followed, then paused and stopped mid-stream, her head craning back towards the place they had been nesting. Curious, I slowed my pace to watch. The mallard waited for his mate to catch up, but she remained still, eyes beaded on what she was leaving behind. Seconds passed, then a minute or two. Seemingly content to wait, the male hopped on a branch protruding from the water and watched his mate. I wanted to see this domestic duck drama play out, but there was a walk to finish and work waiting on my office desk. Wherever these two were going, I mused, they were doing it in tandem. One was looking ahead, one lagging behind, longing for the known, the familiar, the comfort of the nest. What course would they take, I wondered? Would they return to the security of the nest or continue their journey to the far shore? If we stay where we know and are known, there is comfort, caring and community. But if we dare to believe that one can start again in a new place at 44 or 65 or 93? There is more faith than sight, more questions than answers, more possibility than promise. 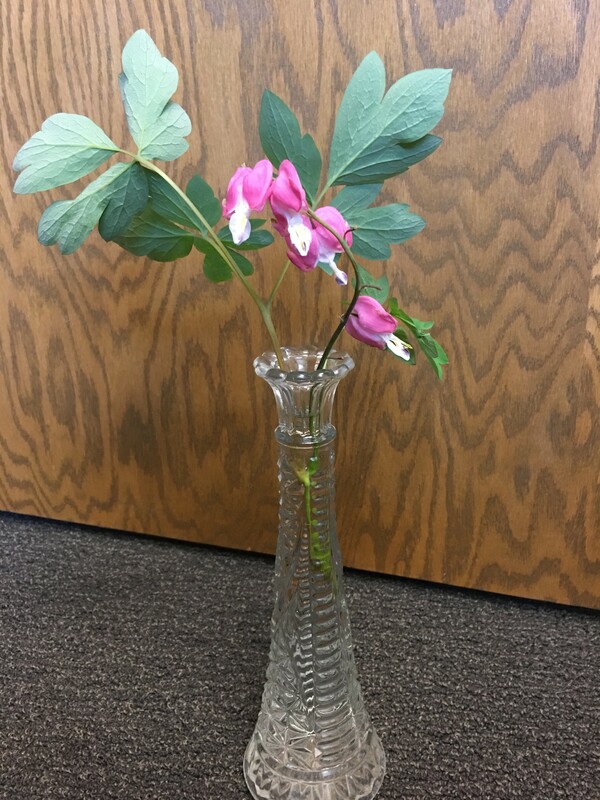 Picked these in our yard this morning. Another walk today, another early morning with the dew flashing diamonds in the lush Midwestern grass. That turn in the path, the familiar little bridge, the stream flowing steadily beneath. An indentation remained in the reeds along the riverbank where a nest had been.The pair of ducks were gone. I’ll miss them, but you know what? I’m happy for them too. 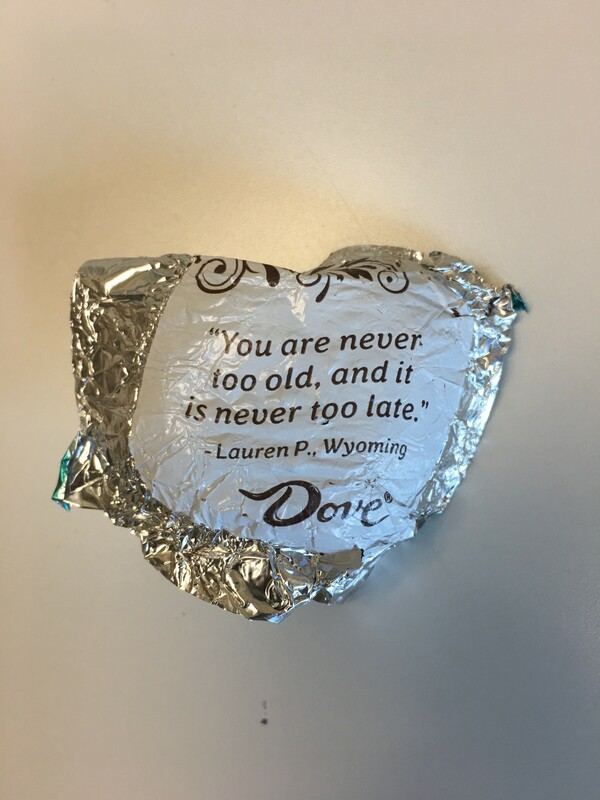 Surprise message in my afternoon chocolate today! This hits me with a particular pang, Maggie! I’m so grateful for the way our paths crossed professionally, but, yes! am LOOKING FORWARD to our friendship continuing on a more personal level. Here’s to new chapters! Cheers, friend. Katherine, it’s a promise! Though we’ve never met we’ve become friends across the miles of the blogosphere, and we WILL stay in touch. Yours is writing I simply love to read. New chapters indeed! Meadows Asst Livinjg apartment after li/ving since 1957 in the home we had built. May God go with you, Mike and your Mom, Eunice, my good friend. Thank you dear Elaine! Your comments always encourage me, and Mom too. Saying goodbye-for-now to Wheaton will be bittersweet, but I’m exited for the adventures ahead! Sure will, and the littles will come to see Peace Ridge as their family home in the mountains. Grateful. Deb, thanks for your comment and for staying in touch. Yes, I’m excited about our new life to come even as I reluctantly release the one we are leaving behind. Hard to believe our Israel trip was four years ago already! Much love to you. I know the Big Birthday is right around the corner – thankful for it just as you wrote so beautifully in your blogpost today. Hope your day was great in every way! One called Minnesota home for 24 years and Illinois the next 69. I wonder what North Carolina will bring?? We hope at least 10 years more, Mom! So glad we are going together. You will all be so missed!!! We are jealous of your new adventure with God at your side. May He bless every step! Cindy, no one has done more here to encourage and support us in ministry than you and Dave. We’ll always be grateful! So beautiful, Maggie. I know these feelings well. You wrote this in a way that many of us will resonate with. I walk that same pond and I believe I have seen those ducks too! Praying for a wonderful new season for you. Ioften pray as I drive by your house for all the changes coming. Linda, I will miss you! Although we’ve had little time together, our hearts have connected in so many ways through our work at Tyndale, our love of writing, and our love for New England among other things. Thank you for your prayers and encouragement! So excited for you, Maggie! Thank you brother Chuck! #41HasCome!! Dear Gail, even though we’ve never met in person to date, you are so consistently encouraging to me. I’m praying God will strengthen your heart physically to match the enormous spiritual heart you have for him and his people. You are a gift!